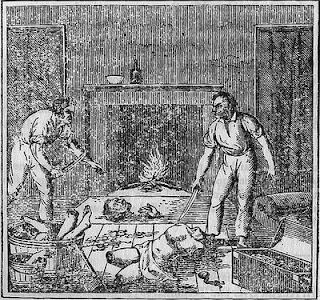 In an empty house in Portsmouth, Virginia, the police found the butchered body, the head, hands and feet partially burned in the fireplace. In an early use of laundry marks, the initials “P.L.” and “M.P.G” helped identify the people involved. Lagoardette had been courting a girl in Baltimore; Castillano was himself interested in her. The three men all were criminal characters. with one hand and holding a knife in the other; that he (Manuel) immediately started up, caught hold on Castilano and besought him not to kill Lagaudette, but C. caught his thumb in his teeth and bit it—at the same time threatening to stab Manuel if he interfered. 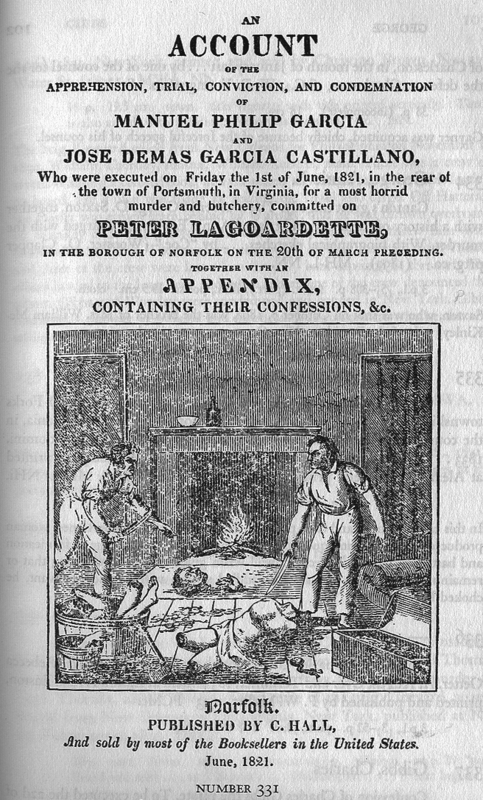 That C. then cut Lagudetette’s throat, took off the head and threw it behind the fire. The innocent, timid Manuel, horror struck at the deed, ran down stairs to make his escape—but was pursued by Castilano and brought back, with a threat of instant death if he repeated the attempt. – That some time afterwards C. began to cut off the limbs, fiercely demanding of him, Manuel, why he did not assist? Who replied, he could not, it was too horrible!—It may be admitted that the murder & butchery was perpetrated in the manner here described, but not by Castilano alone; Manuel undoubtedly was an accomplice, if not the principal in the crime; he is deemed the worst of the two. – He states that he arrived in this country 12 months ago from Porto-Rico, in the schr. Zeno, at Philadelphia. Castilano, according to his own account, has been ten years in the United States, & lived some time in Savannah, where he married. I am hopeful that with a little more research I will be able to post a full account of this murder. McDade, Thomas M.. 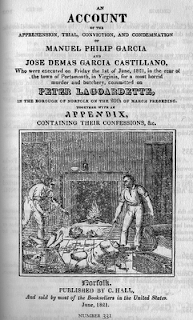 The Annals of Murder: A Bibliography of Books and Pamphlets on American Murders From Colonial Times to 1900 . Norman: University of Oklahoma Press, 1961. Thanks Leandro, and best of luck with your blog.